Hmm, I've seen similar pics around, but I was surprised to find that a good vector had not been submitted to yet. So here it is! Twilight's equivalent of telling others to go buck themselves. glad im not the only one who thinks that about that pink abomination. 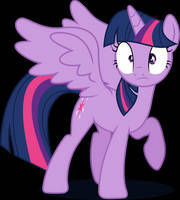 So... Princess Twilight... gonna do anything this episode? Are you going stop acting like a useless character and start taking some command? "But the map didn't tell me to do anything." So you're going to let a map... tell you what you can, and cannot do? "Well.. when you put it like that." Get out there and do something, dammit! You useless pile of purple. You're not even the Princess of Smiling and Waving anymore. Why can't the writers write you properly?! They had no idea WTF they were doing in the first place? Oh, don't worry, I'm sure there's plenty of fanfics that have written you properly. I've just yet to find any. 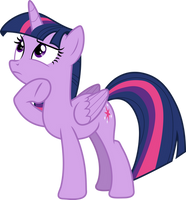 Note: I'm not opposed to Princess Twilight, they just haven't done anything interesting with her... at all... since Season 2. You know... when she wasn't a princess. just trash your books if you get bored of it twi ! Whoa, whoa, whoa, let's not get crazy here. That's mean! 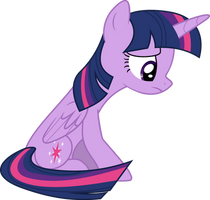 You're hurting my feelings Twi!